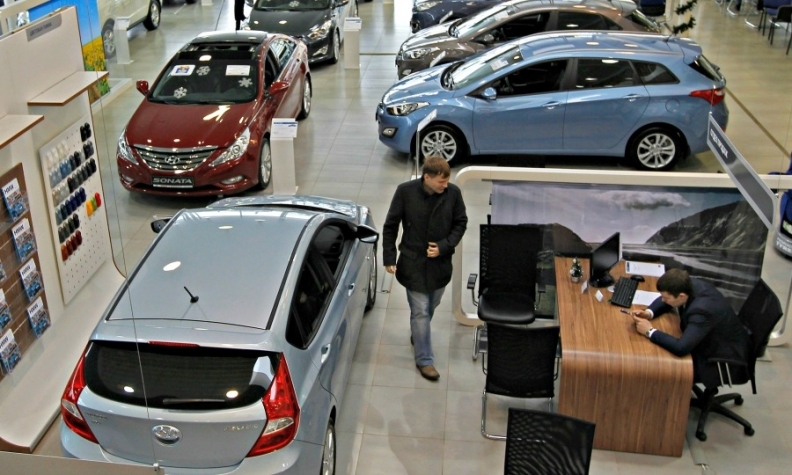 The weaker ruble means fewer people can afford a new car in Russia. MOSCOW -- New-car sales in Russia rose 9.4 percent to 137,894 last month as the market's rebound begins to gather pace. First-quarter sales are up 1 percent to 322,464 year-on-year, according to data from the Association of European Businesses in Russia (AEB). "It is good news for our market, which has not seen positive quarter results for more than four years," Joerg Schreiber, AEB chairman, said in a statement on Monday. Sales at Lada rose 13 percent in March as Russia's best-selling brand continued to benefit from robust demand for two new compact models, the Vesta sedan and X-ray crossover. Volume at Kia, the country's No. 2 brand, rose by 18 percent, while third-placed Hyundai jumped 29 percent. Renault, at No. 4, saw registrations rise 19 percent, while sales at fifth-ranked Toyota grew 18 percent. Among other major players, Volkswagen brand sales rose 16 percent in March, while Ford's registrations were up 3 percent and Nissan dropped 6 percent. • Download PDF, above right, for Russia sales by automaker, brand and model for March. The AEB expects sales to grow by 4 percent this year after a four-year decline. Russia's economy was hit by an economic crisis driven by low oil prices and Western sanctions over Moscow's actions in Ukraine.